After the release of Ubuntu Feisty Fawn, I decided to try upgrading my installation of Edgy Eft directly using Ubuntu Update Manager. It wasn’t working for various reasons so I used the command line to run apt-get upgrade. That was a big mistake. It downloaded and installed a few packages which upon reboot, broke Gnome. I was able to only get Ubuntu to boot into run level 3. I poked around a bit and couldn’t fix the problems mainly because I didn’t have a wired Internet connection and I couldn’t effectively connect to a Wireless Access Point using Network Manager from the command line (I need to figure out how to connect to a wireless AP from the command line, especially when I can’t remember the WEP or WPA passcodes). After a frustrating night, I decided to use my MacBook to download the Feisty Fawn LiveCD. I started the download at night via BitTorrent and by the time I woke up, the download was done. I burnt the iso image to a CD and popped the freshly minted CD into my ThinkPad T60. During the installation, I decided to do a completely fresh install of Ubuntu so I wouldn’t have to worry about all the broken dependencies from Edgy Eft and how they might make Feisty Fawn unstable. I did, however, preserve my home partition and mounted that into the installation of Feisty Fawn. The installation process was very easy and allowed me to get my T60 up and running within and hour. Feisty Fawn picked up all the necessary drivers for the ThinkPad T60. The Intel 3945 wireless drivers were also installed and setup. The Ubuntu installation also allowed me to use the ThinkPad keys for volume control and brightness control with complete OSD. It didn’t appear to install the tpb packages but managed to provide similar functionality. Feisty even recognized the proprietary ATI drivers that are necessary for the Radeon X1400 in my ThinkPad T60 and made it very easy for me to download and install the drivers, though, they aren’t open source. The open source drivers for the ATI video card were loaded by default and worked pretty well. I’m not doing any gaming on Ubuntu so 3D graphics aren’t a major concern. I have wanted to play with Beryl and Compiz for a while and now I finally got my chance. It took a bunch of tweaking to get going. Unfortunately, Feisty Fawn has a broken package that doesn’t include the beryl-xgl package. I was able to download an older package and extract the relevant binary and put it into the right place. After a few hours of fiddling with driver updates and getting to the bottom of the whole beryl-xgl problem, I have the ATI drivers running with XGL on Feisty Fawn. Though, I’ve read it’s pretty unstable to use the proprietary drivers with XGL, I’ve yet to see any major problems. Beryl is pretty slick but it’s a resource pig. Even so, I haven’t stopped using it. The only thing that’s a bit annoying is that every time I login, I have to reload the Beryl Window Manager. If I don’t reload, my Metacity mobile themes load up and Beryl doesn’t. This is apparently caused by Beryl crashing immediately upon login but not crash when I reload. I’ll get around to writing a full post on my experience installing Beryl on the T60. Below are some screenshots of Beryl under Ubuntu on my ThinkPad T60. Upon booting up into Feisty Fawn, I didn’t notice any significant changes. Luckily all my settings were saved in my home directory and I was quickly attached to my wireless network. I did find that the Network Manager Gnome applet had an option to create a manual configuration which I don’t think it did before. The sleep functionality is still broken. I can put the T60 to sleep using the hotkeys but waking up from sleep is a problem. However, applying this fix solves the sleep and hibernation problem on Feisty Fawn (unless you are using Beryl). Overall, I find Ubuntu to be the best desktop Linux distro I’ve used thus far. Though, I’m still more comfortable using and developing on Fedora, I find that the basic things a distro should do work very well on Ubuntu and not so well on Fedora or OpenSuse. There’s a lot more tinkering involved with these other distros. 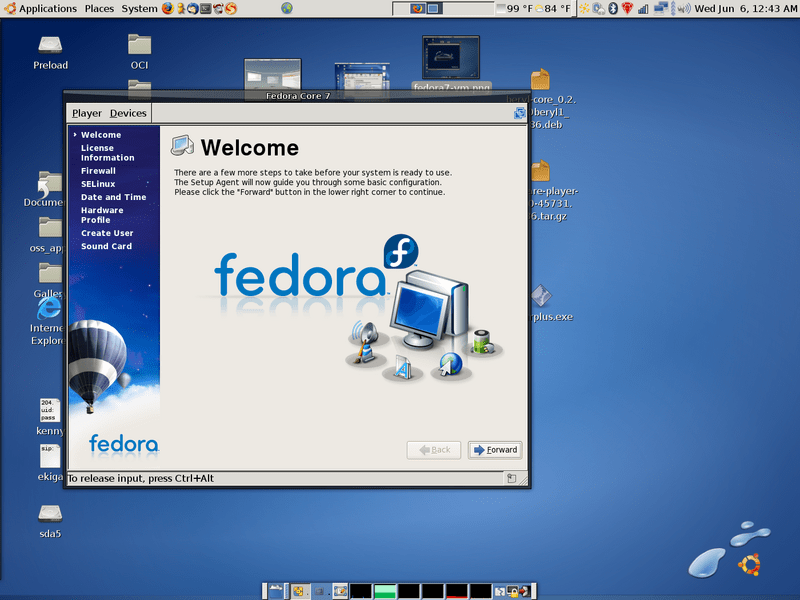 Hence, I’ve decided to install Fedora 7 from the LiveCD into a VMWare appliance. 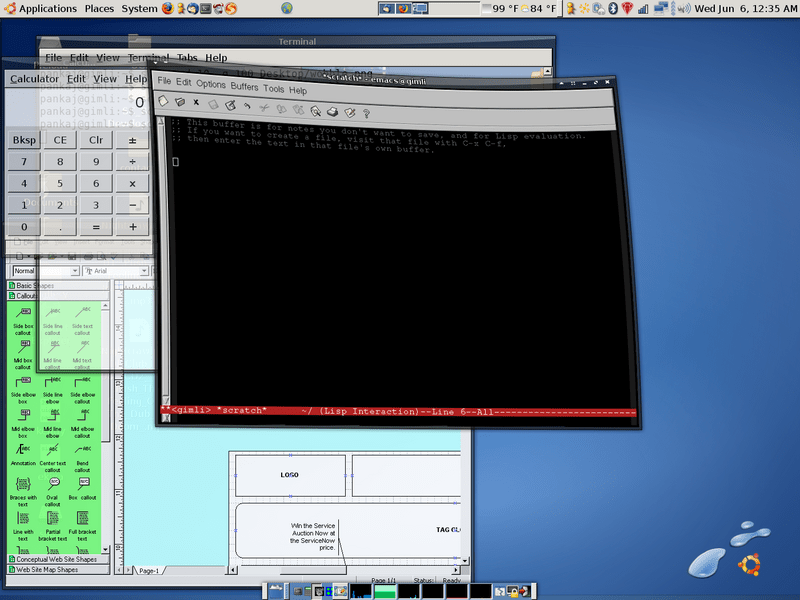 Below are a few screenshots of Fedora 7 running in a VM. I recently loaded my Lenovo T60 with the current Ubuntu software. I installed it using the dual boot now when I log into Ubunto I have problems with connecting to the internet through dsl. I was wondering if you encountered the same problems? problem or using a straight Ethernet. Next post: Apple MacBook Hard Drive Goes Kplunk!